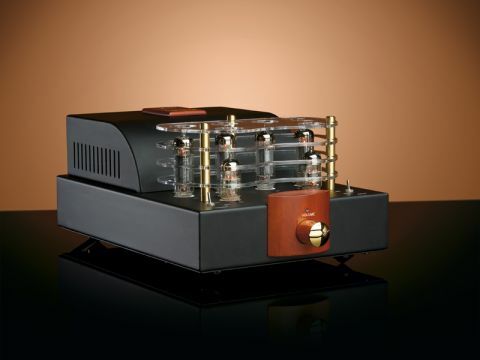 Designed to demonstrate some of the star quality of the larger A30, the A10 integrated valve amplifier is the newest and least expensive arrival in a range from Pure Sound which includes amps, preamps and phono accessories. In fact, due to market enthusiasm for the new amps, the A10 may well rule the roost in sub-£1,000 models. The A10 is a class A Ultra Linear push-pull design. It uses a relatively conventional complement of valves, consisting of a pair of 6N3 valves in the preamp section and a quartet of 6P14 valves for the output stage. Power is quoted at 10 watts per channel, and the output transformers are wound to accept either four or eight ohm loudspeaker loads. Internally, the amp is constructed from high-quality components such as carbon film resistors and polypropylene coupling capacitors, whilst the inputs are gold plated – which is no mean feat considering the price. Special mention must also go to the volume control – a top-of-the-range film potentiometer. Not only does it have a smooth, fluid action, but it seems completely free of any channel imbalance, even at very low volumes. Perhaps as a result of the impressive quality of the components specified by the designer, the feature set of the amp is somewhat limited; it sports a pair of line inputs selected by a two-position switch, a similar switch to power it on and off and that rather impressive-looking volume knob. Anyone seeking more inputs, phono stage or, indeed, a remote control will need to look elsewhere. The 10 watt output will go a surprisingly long way if partnered correctly, but those interested in moving to an A10 from a more powerful solid-state amplifier will obviously need to ensure that their speakers are sensitive enough for it to generate reasonable listening levels – a great many of the better known and respected designs at this price point will not be. Other suitable options are available from manufacturers such as Heco, Tannoy and Triangle. The fit and finish of the A10 is very good indeed. Despite its diminutive chassis, this amplifier tips the scales at no less than 8.5 kilograms and feels extremely solid with neatly rounded edges adding to the quality feel. The wood trim around the volume knob is a neat visual touch and is matched by a plate on the transformer cover. As with a few other designs I have seen recently, the delicate valves are protected by a series of acrylic pieces separated by metal uprights. This is undoubtedly far easier on the eyes than a metal cage, although depending on how determined any of your offspring are, it's probably not as childproof. The speaker terminals on the rear are large and solid three-way posts which should be able to accommodate all but the most enormous varieties of speaker cable. In use, the A10 proves itself free of the idiosyncrasies and foibles which sometimes come with valve amplifiers and should prove a positive introduction to anybody who has selected one as their first foray into valves. Setup is aided by an informative, well-written manual that should allow even a complete novice to get it running. The A10 warms up fully in less than 20 minutes and seems totally free of background noise or humming that can sometimes blight valve amps. The overall result is that the A10 is one of the most cost effective ways of securing a well-built valve amp with high quality components throughout. Considered against other EL84 designs, it's less than half the price of similarly powerful models which is impressive considering how much remains. On the negative side, it's limited to two sources, which may or may not concern you, and this can be overcome by adding inputs with a DAC or switching box. The wider consideration, of course, with buying an amp with a limited power output is the likely need to buy suitable speakers for it to perform at its best. This is a more pronounced requirement than with a similarly priced solid-state amplifier. Your willingness to invest in a new pair of speakers may increase significantly upon listening to it though. Half an hour with a properly partnered A10 and you will have found a way to manage with two inputs and 10 watts. Where the A10 is emphatically not in keeping with many valve amplifiers, particularly at this price point, is the speed and surprising grip it demonstrates. There is none of the bloat or softness that can reduce the impact of transients or quick bass lines – the A10 has a speed and agility that is often lacking in valve designs. At the same time, the natural and unforced presentation does not seem to result in loss of detail and the all-important sense of excitement that can keep the attention for hours. In absolute terms, the bass – although fast and detailed – lacks the seismic quality normally only achieved with rather more power. Once it has run out of volume, it can sound slightly strained – although it will hang on for longer than you might expect and never become unduly harsh or severely distorted. The classic comment that a valve watt seems burlier than a solid-state one certainly has some credence here. Unfortunately, I cannot give an unconditional recommendation to the A10 as a perfect choice of amplifier at this price point. Many people who are already happy that their speakers are working well in their rooms are going to find the output of the A10 too limited to do justice to loudspeakers of average sensitivity. Others will need more than two inputs, and may be unwilling to sacrifice remote control to get it. for those able to work within these limitations, however, the A10 demands an audition. Simply put, it never fails to make music an enjoyable and rewarding experience, which is surely the purpose of a good hi-fi system in the first place. for many, this will be enough.